Frederick Arthur Hunt, known as Fred, was born in Nether Compton, Dorset, (just east of Yeovil) in the late autumn of 1892. He was the son of timber merchant's foreman William George Hunt (1859-1907) and Elizabeth née Willis (1859-1930). William and Elizabeth had six children, all born in Nether Compton; Annie M (b1885), Henry George (1887-1953), Albert W (b1889), Alice G (b1891), Frederick and Claude W (b1897). 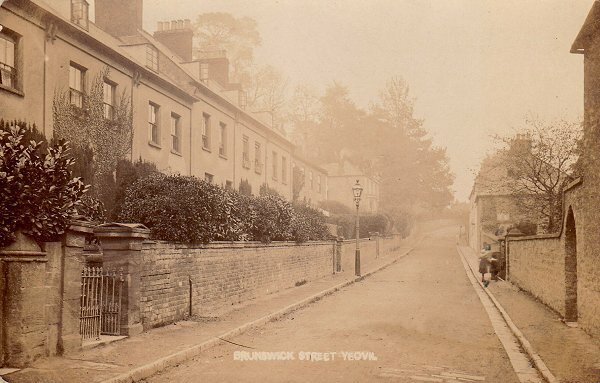 By the time of the 1901 census the family had moved to Yeovil and were living at 3 Brunswick Street. In 1907 Fred's father died and by the time of the 1911 census Elizabeth had moved her family to 22 Orchard Street. In the census 20-year old Fred gave his occupation as a butcher, but it is known that he then worked at the Nautilus Works on Reckleford. It appears that Fred then moved to London where he married Lydia Louise Evans (1881-1975) on Christmas Day, 25 December 1915 at Newington St Andrew. The following year Fred and Lydia, who lived in Southwark, were to have a daughter, Louise Victoria (1916-2009). Fred enlisted in the Army at Fulham. He became a Private (Serial No 3400) in the 25th County of London Cyclist Battalion, London Regiment. From his Service Number we know that he enlisted on 3 March 1916. How long Fred remained in this battalion is unknown but their war service was in India and the North West Frontier. Whether or not Fred saw service in this theatre is unknown but is likely since he did not go to France until the end of 1916 / beginning of 1917. Fred was transferred to the 1st (City of London) Battalion (Royal Fusiliers) with a new Service Number 203466. The first action the 1st Battalion saw in 1917 (almost certainly including Fred by this time) was the Battle of Vimy Ridge. This was a military engagement fought primarily as part of the Battle of Arras, in the Nord-Pas-de-Calais region of France. The main combatants were the Canadian Corps, of four divisions, against three divisions of the German Sixth Army. The battle, which took place from 9 to 12 April 1917, was part of the opening phase of the British-led Battle of Arras, a diversionary attack for the French Nivelle Offensive. After the battle Fred, with the 1st Battalion, resumed daily life in the mud of the Somme trenches until his battalion took part in their next set-piece battle, the Battle of Messines. The Battle of Messines (7–14 June 1917) was an offensive conducted by the British Second Army, under the command of General Sir Herbert Plumer, on the Western Front near the village of Messines in West Flanders, Belgium. The offensive at Messines forced the Germans to move reserves to Flanders from the Arras and Aisne fronts, which relieved pressure on the French. The tactical objective of the attack at Messines was to capture the German defences on the ridge, which ran from Ploegsteert (Plugstreet) Wood in the south, through Messines and Wytschaete to Mount Sorrel, to deprive the German 4th Army of the high ground south of Ypres. The ridge commanded the British defences and back areas further north, from which the British intended to conduct the "Northern Operation", to advance to Passchendaele Ridge, then capture the Belgian coast up to the Dutch frontier. The battle began with the detonation of a series of mines beneath German lines, which created 19 large craters and devastated the German front line defences. This was followed by a creeping barrage 700 yards (640 m) deep, covering the British troops as they secured the ridge, with support from tanks, cavalry patrols and aircraft. The effectiveness of the British mines, barrages and bombardments was improved by advances in artillery survey, flash-spotting and centralised control of artillery from the Second Army headquarters. The Battle of Messines was a prelude to the much larger Third Battle of Ypres campaign. After a few weeks respite the 1st Battalion next saw major action in the Battle of Pilckem Ridge, a part of the Battle of Passchendaele. The Battle of Pilckem Ridge, 31 July – 2 August 1917, was the opening attack of the Third Battle of Ypres. The British Fifth Army, Second Army and the French First Army on the northern flank, attacked the German 4th Army which defended the Western Front from Lille, to the Ypres Salient in Belgium and on to the North Sea coast. On 31 July, the Anglo-French armies captured Pilckem Ridge and areas either side, the French attack being a great success. After several weeks of changeable weather, heavy rain fell during the afternoon of 31 July. British observers in the XIX Corps area in the centre, lost sight of the troops that had advanced to the main objective at the green line and three reserve brigades pressing on towards the red line. The weather changed just as German regiments from specialist counter-attack Eingreif divisions intervened. The reserve brigades were forced back through the green line to the intermediate black line, which the British artillery-observers could still see and the German counter-attack was stopped by massed artillery and small-arms fire. The attack had mixed results; a substantial amount of ground was captured by the British and French, except on the Gheluvelt Plateau on the right flank, where only the blue line (first objective) and part of the black line (second objective) were captured. A large number of casualties were inflicted on the German defenders, 5,626 German prisoners were taken and the German Eingreif divisions managed to recapture some ground from the Ypres–Roulers railway, northwards to St Julien. For the next few days, both sides made local attacks to improve their positions, much hampered by the wet weather. The rains had a serious effect on operations in August, causing more problems for the British and French, who were advancing into the area devastated by artillery fire and partly flooded by the unseasonable rain. Two weeks later Fred saw his last action in the war, the Battle of Langemarck. The Battle of Langemarck from 16–18 August 1917, in which the (City of London) Battalion (Royal Fusiliers) - including Fred Hunt - took part, was the second Allied general attack of the Third Battle of Ypres. The battle took place near Ypres in Belgian Flanders on the Western Front. The Allied attack succeeded in the north, from Langemarck to Drie Grachten ("Three Canals") but early advances in the south on the Gheluvelt Plateau were forced back by powerful German counter-attacks. Both sides were hampered by rain, which had a greater effect on the British who occupied lower-lying areas and advanced onto ground which had been frequently and severely bombarded. Fred was killed in action on the first day of the battle, 16 August 1917. He was 26 years of age. 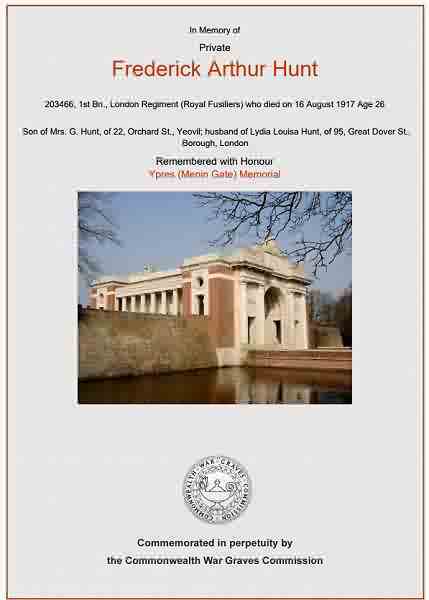 Frederick Hunt is commemorated on Panel 52 of the Ypres (Menin Gate) Memorial, West-Vlaanderen, Belgium, and his name is recorded on the War Memorial in the Borough. Albert Burgess, Harold Dicks, Robert Fry and Alfred Tuck. A postcard dated 1906 looking along Brunswick Street with Brunswick Place and Brunswick Terrace at left. 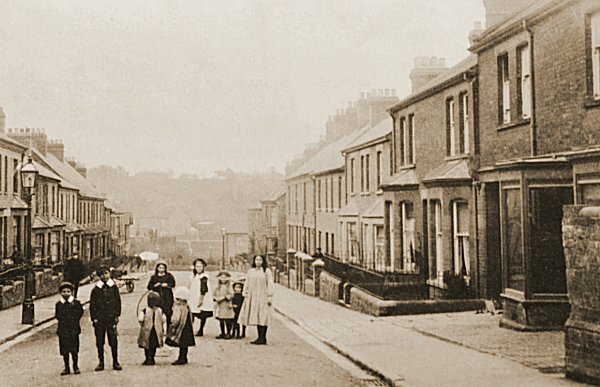 In 1901 the Hunt family had lived in one of the houses at extreme left. Orchard Street photographed from near the junction with Huish, around 1895. After the death of her husband George in 1907, Elizabeth Hunt moved to 22 Orchard Street with her children, including Fred. The Commonwealth War Graves Commission certificate in memory of Frederick Hunt.